I have spent years of my life making New Years resolutions that were quickly forgotten. Loose weight, exercise, take better care of my skin yada, yada, yada! The last few years I haven't bothered to put the unnecessary stress on myself. I just wanted to be happy. To live, laugh and love. This last year has been incredibly tough on myself and my family. We are holding strong and will survive. We have loved each other like there is no tomorrow and, many times it seemed like there wasn't. However, I feel we have lost the laugh and live part of that equation. This my friends is my resolution! 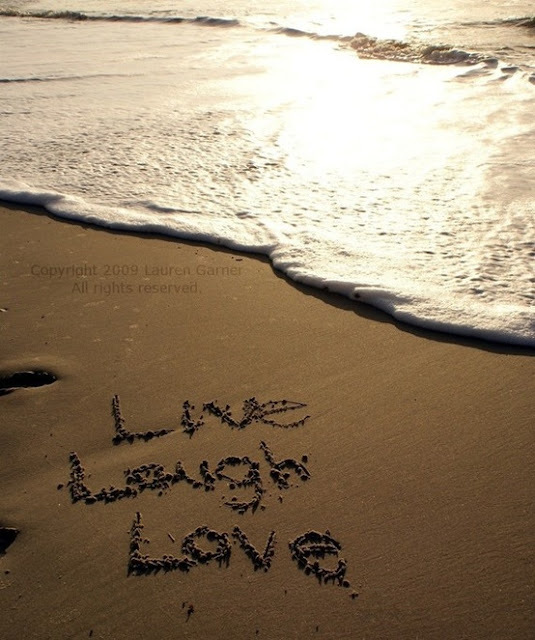 Love as always but relearn how to laugh and live more joyously. So to all of my bloggy friends I hope you find true happiness in 2013 and just remember to Live, laugh and love! Here is a picture of the Man and I at a New Years Day celebration at a friends house at the lake. I think we are off to a good start! And yes, I do have the ugly boots on! Remember I am living in flatville right now! Lovely pictures. Hope your 2013 is filled with love, health, and happiness! You guys are so cute! I hope 2013 brings you perfect healing and recovery and no more falls!! You have been an inspiration to others on how you have handled your recovery...thanks, Tammy. Happy New Year 2013 to you and your loved ones. Tammy! hi! Thank you for your fun comments. Leggings and uggs are quite alright if you are comfy and being casual (at it looks like you are here with your handsome man) so don't worry a bit. The best way to get healthy is to smile (which you do) and to not worry. So ...enjoy your comfy clothes. k? Here's to a much, much, better 2013. 2012 absolutely sucked. You do, however, look radiant and happy as you are kicking 2012 to the curb! HAPPY New year!! what a cute couple you make!! May 2013 be a fabulous healthy year for you!! You are on FIRE with these recent posts...I know you fret about being older than other bloggers but don't discount the wisdom you share with us young 'uns. Maybe I have a bit of an old soul in me because the idea of entering the New Year in cozy clothes sounds incredibly appealing. You and your hubby look pretty-loved up, all the best to you!